Home Allergies SUGAR-FREE ICE CREAM PERFECTION! 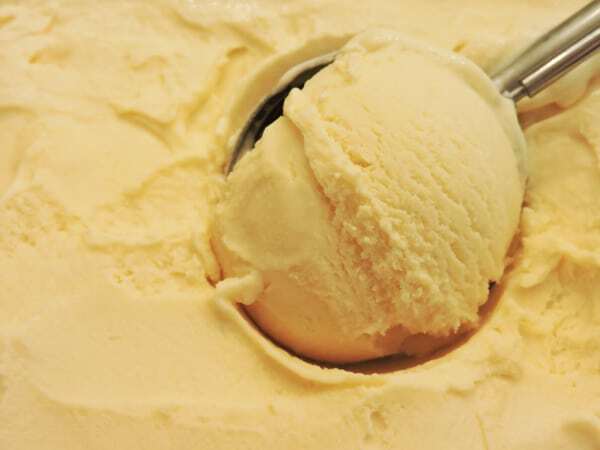 Sugar-free ice cream is hard; not just hard to make, but literally hard. I got a Breville ice cream maker for my birthday on September 2nd. I love its convenience and speed, but it has taken me this long to perfect a recipe using it. I started with my favorite flavor: custard-based, plain vanilla, which presents the biggest challenge since there’s nothing to hide an off taste or imperfect texture. If I could get that right, the rest would be easy. I had some additional problems to work around that I will explain in the NOTES below, but I finally have a winner! It produces ice cream with a lovely, smooth mouth feel and scoop-able consistency straight out of the freezer. Liquid sweetener to taste, if needed. Place a container in the freezer to use to store the finished ice cream. Beat egg yolks in a heat-resistant bowl with Allulose and xylitol, if using, until thick. Bring water to a simmer. Whisk about ½ of water into egg yolk mixture..
Add soft cheese to custard and stir until melted. Sprinkle collagen powder over custard and stir until smooth and free of lumps. Let mixture cool for a few minutes and gently stir in cream, salt, and vanilla. Taste mixture and add a few drops of liquid sweetener if it is not sweet enough, keeping in mind that it will taste less sweet when it is frozen. Chill mixture in refrigerator until cold. Place in ice cream maker and freeze according to manufacturer’s directions. Scrape ice cream into chilled container. (A silicone basting brush is useful for getting the ice cream off the dasher.) Cover with a layer of parchment paper and then a sheet of aluminum foil. Freeze for an hour for firmer ice cream. Ice cream should be scoop-able straight out of the freezer, but can be stored in the refrigerator for a few minutes to soften up, if desired. Recipe makes about one quart or 8 servings of ½ cup each. Allulose and sweeteners are not included in nutrition data. They have little, if any, effect. Ice cream cones are back! Some ready-made, gluten-free cones are very low in carbs and they taste exactly like the old, high-carb versions with gluten.. (I’m talking about the ones that look like the picture, not the pointed, sugar cones.) They only have 2 carbs each, but you can make them even lower if you don’t eat the bottom of the cone. It is reinforced with cross bars for stability, which prevents the ice cream from going all the way down so there’s no point in eating that part anyway. 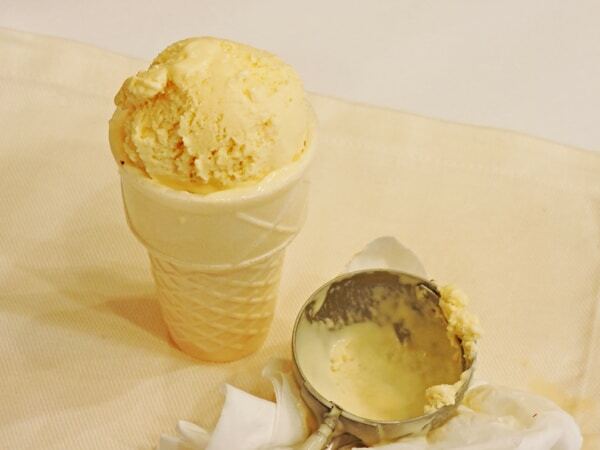 Toss the last 1/2-inch of the cone and you will cut the carbs by one-third. The part you eat will have only 1.3 grams. There may be other brands with similar carb counts, but the one I bought was called Let’s Do…Gluten Free Ice Cream Cones. Allulose is only 70% as sweet as sugar and it browns a little faster. Although the label says Allulose has 3 grams of carbs per teaspoon (regular sugar has 4 grams) it is absorbed, but not metabolized and then almost totally excreted. Since it is not fermented in the gut, it cannot cause digestive distress like some sugar substitutes. Beneficial side effects include weight loss and better hypoglycemic control. Xylitol is a sugar alcohol that tastes good and has health benefits for bones and teeth. It can cause digestive upset for those who are sensitive, so some of us can’t use very much. Just a little works wonders in this recipe..
Oligofructose is the base for Just Like Sugar and Sweet Perfection, two good, probiotic sugar substitutes made from sweet fibers that also should help. Another option is LC-Foods Sweet, a mixture of many different sweeteners that has a nice clean taste. Two of the most common food allergens are dairy and eggs. After my meltdown in 2013, I discovered that I was allergic to both, in addition to a lot of other things.That story is here. After some research and a lot of trial and error, I learned that I was only allergic to one kind of milk protein, called A1 beta casein. Older breeds of cows, such as Jersey and Guernsey, traditionally produce A2 milk. Unfortunately, most of the milk from modern dairy cows comes from A1 Holsteins because they are more productive and are therefore more profitable. The milk from goats, sheep, camels, buffalo, yaks, and donkeys are also mostly A2, so we have other options for cheese, yogurt, and butter, but I don’t currently have access to cream from any of those sources. Luckily, I can buy A2 cream from Jersey cows that comes from two local dairies. It is sold in glass bottles with a hefty deposit. It is wonderful, rich cream that has such a high fat content that it turns to butter in the blink of an eye. I strained the custard after cooking and still got little lumps of pure butter in the finished ice cream. That is why my recipe now says to cook the custard without the cream and gently stir it in just before freezing. Eggs: duck eggs are now available at a few stores near me and they make a very rich, golden ice cream. I’m still avoiding all things chicken: meat, eggs, broth, and feathers, but I can eat quail eggs and duck eggs. Quail eggs are impossible to separate, so duck eggs it is! I don’t normally worry about eating raw eggs, but I’m now taking a medication (hydro-cortisone) that puts me in the high-risk category for food-borne toxins. A custard base needs to be heated to 160% F to kill off any Samonella. I really prefer the taste of the cooked custard in this recipe anyway, so I would do it whether I needed to or not. Collagen: is the protein-rich, good stuff in bone broth that makes it such a super-food. Ice cream recipes traditionally call for milk or half and half along with the heavy cream, which adds carbs. Collagen provides a nutrition bonus without the sugar, and, no, it does not taste at all beefy or savory. . Perfect textured ice cream, Sugar-free Ice Cream. Bookmark. The Great Lakes collagen would be the one in the green can, right? Right, Kathy. It’s the green can. Hi Andrea. Allulose is not a sugar alcohol. It is a kind of sugar that is not digested but goes into the blood stream and then gets excreted in the urine. Since it doesn’t ferment in the gut, there are no digestive issues with it. Erythritol ia a sugar alcohol, but the only one that doesn’t cause digestive distress. But–it has a funny, cooling taste. It also makes baked goods go grainy after a while. Swerve is a brand of fermented erythritol that some people think tastes good, but to me it tastes just like regular erythritol. I don’t know much chemistry, but Allulose may be similar to Tagatose, an older sweetener that I used to use sometimes. Perhaps someone out there can explain all of this to us? Thanks Judy. It is interesting that they both (allulose and erythritol) come from corn. Yes, it seems you can make anything out of corn! I’m sure they could make it out of tapioca if they tried. They do at least claim that it is non-GMO. If that is true, it may come from another county as think there may not be any left in the U.S. The ice cream looks amazing. I am definitely going to give it a try. Thank you for the information about the different types of dairy. I think that will be worth experimenting with for many of us who struggle with allergies. Does duck eggs taste similar to chicken eggs? You are welcome, Noline! I hope you enjoy it as much as I did. OMG this really IS the best low carb ice cream EVER. I’ve been searching high and low for one that doesn’t crack my teeth when I bite into it. It was a little soft, but that’s better than too hard. I’m liking the Allulose. I’ll be checking my ketones to see how my body reacts. I ended up having two servings ? Thanks, Carol P! Mine gets firmer if I leave it in the freezer overnight. It’s still scoop-able, even then. Hi, Judy. I wonder if Allulose spikes insulin? I can’t find anything about that. Carol, the company says it does not spike insulin or blood glucose at all. It goes into the blood stream but is not metabolized and then is excreted. They say it actually lowers your blood glucose response! I’ve heard from some readers that it does not affect their glucose level.